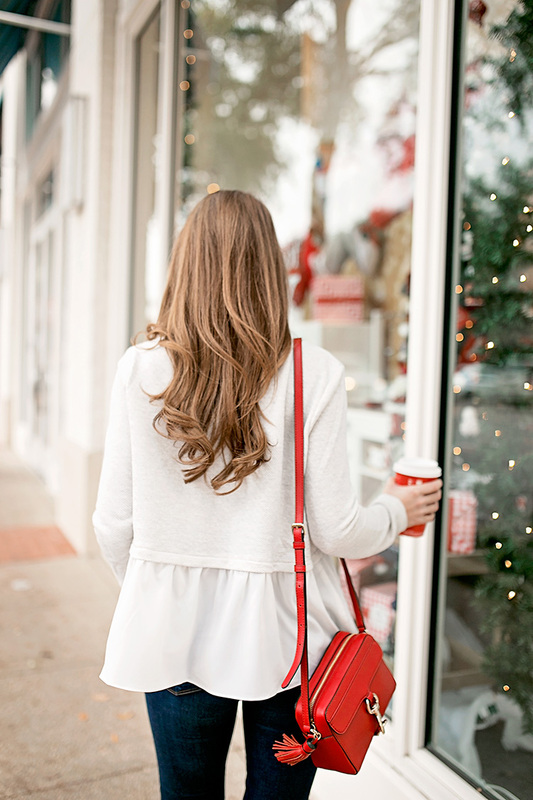 Case in point – no color makes me feel quite as festive as red. Since I usually associate ruby tones with striking evening gowns or a bold lip, I forget how fun it can be to incorporate red into little details throughout more casual outfits. When it came to infusing a little more Christmas cheer into this classic white blouse and jeans combination, all it took was a few pops of that signature color to really start making things merry and bright! When it comes to finding pieces to mirror the festivity of the season we’re in, I always have luck in Nordstrom’s Trends department. I didn’t know about this curated collection for the longest time, and now that I do it’s made shopping so much more efficient! 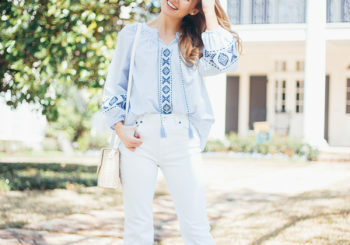 This entire outfit is from Nordstrom, but I found this peplum top and the red cross body while browsing the cute new arrivals in the Trends department. Such a time saver! The Nordstrom Trends department is a selection of the best, on-trend pieces store-wide for those after a young contemporary look… AKA perfect for high school, college and young adults! So if you’re Christmas shopping for someone who falls into that category, head to the department here to see the selection. Even though it’s Monday, I am SO excited! My mama and I are flying to somewhere fun this morning! (If you watched my latest video then you know where!) I can’t WAIT to take y’all along for this trip! P.S. 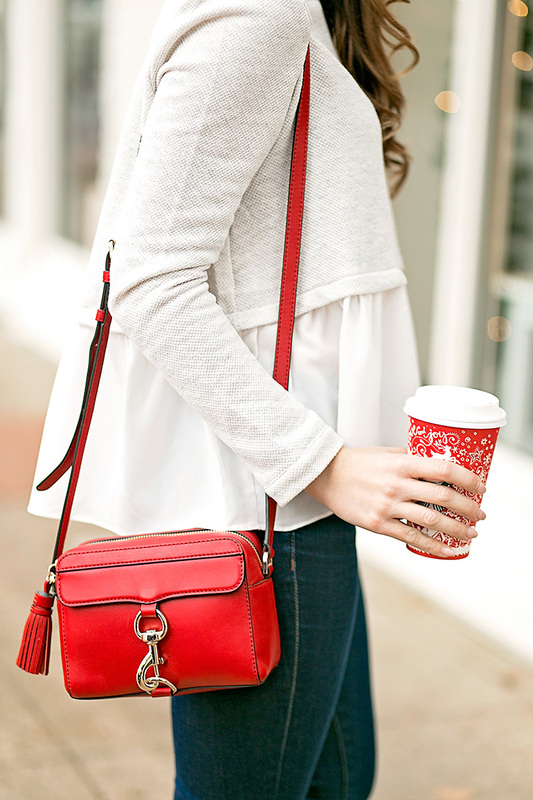 Are you a fan of the red tassel cross body in today’s post? If so, be on the lookout this Wednesday for a fun announcement! Thank you, Nordstrom for sponsoring this post. Such beautiful photos! Have fun with your momma! Gorgeous outfit! I love the colour red but I don’t wear it much but I definitely should, it’s a beautiful colour. The pops of red makes your photos stand out like crazy!!! Love them!!!! 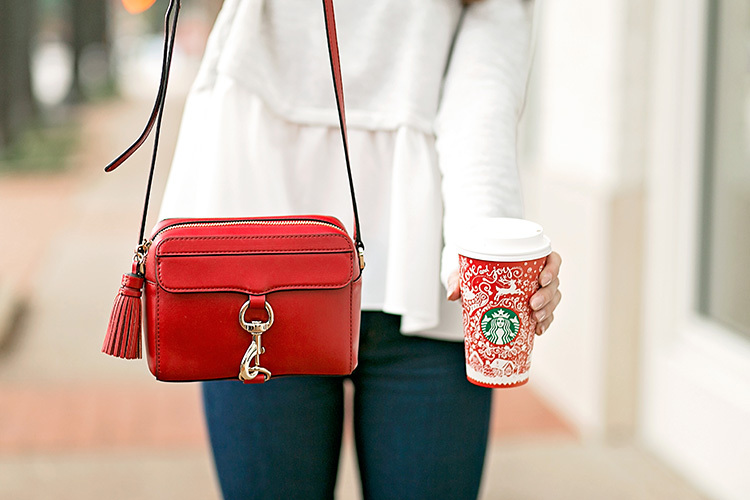 Starbucks is always a good accessory!! Nice looks of red BTW. I love when an outfit has a pop of color, this outfit is so cute. Perfect for Christmas shopping! Ah how I love red for the holidays too! Nothing is quite as festive as a few pops of that vibrant color! Hope you and your mom have so much fun on your trip! 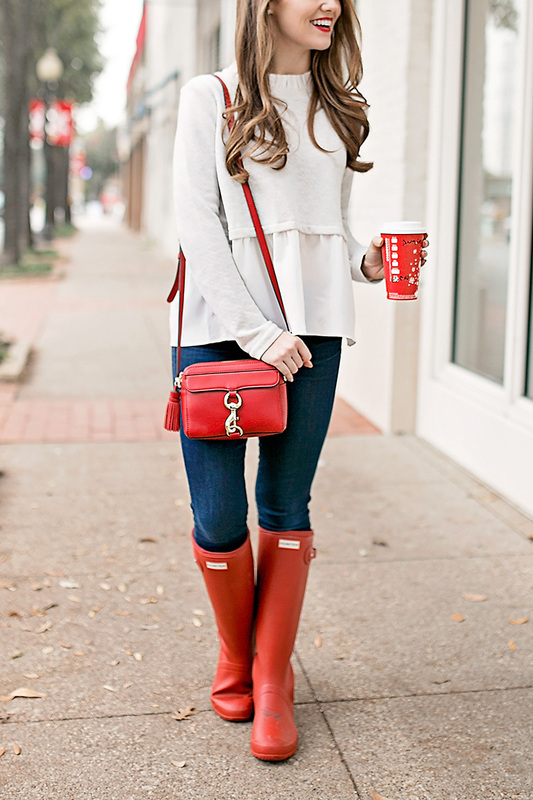 This sweater is so cute and looks perfect with your red bag and hunters! 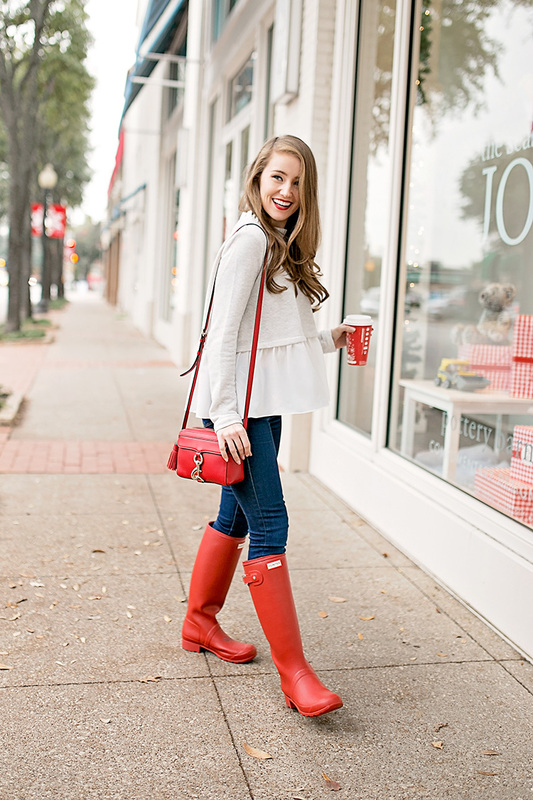 I love how you styled your Red Hunter boots, and added color to this outfit. I am doing a post on how to style Red Hunters for the Holidays and was wondering if I could link your blog post to my page for inspiration for my readers? I adore your blog and style and I think my readers would too.